1. Read (or retell) pages 16 and 17 in Celebrating the Twelve Days of Christmas. Read any other books your family may have on the Mother of God. 2. Enjoy pears today! We might add them to a fancy salad for lunch! 4. Spend time together as a family. Play games or work on puzzles together, find good places for presents that were received and organize a box of things to give to others (gifts that cannot be used and items that are no longer needed) or to donate, craft or bake together, etc. 5. Watch a good Christmas or religious movie together with delicious snacks! Our children watched several selections from Jesus of Nazareth with us (with of course, lots of commentary!). Thanks so much for these posts! We are Pentecostal Christians looking for ways to celebrate the 12 days of Christmas. 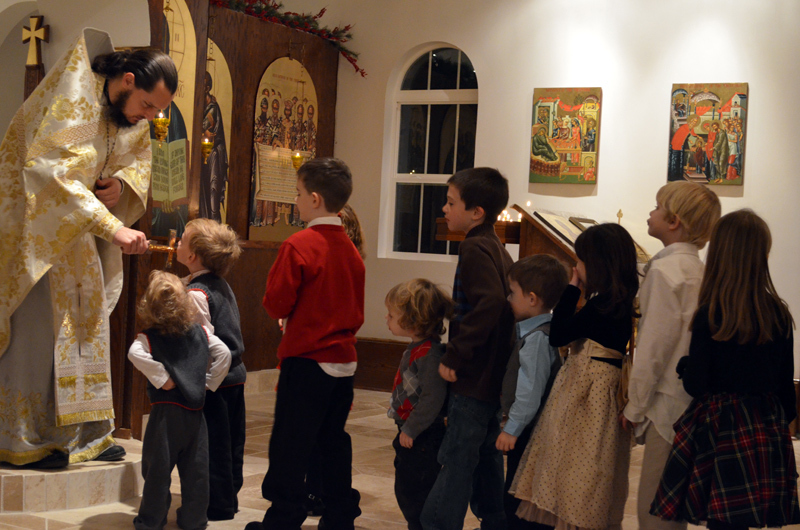 (We have been slowly but surely incorporating more of the liturgical year into our lives. We have begun our own Advent traditions, and now we'd like to add some for the 12 days!) It's so interesting to see how you celebrate, and it's got some ideas brewing in my head for our own family. Yarn Along: Christmas is Coming!